I chose this infographic, which depicts the evolution of television because I believe that it exemplifies the concept of small multiples well. According to the readings by Edward Tufte, “small multiple designs, multivariate and data bountiful, answer directly by visually enforcing comparisons of changes, of the differences among objects, of the scope of alternatives.” That being said, small multiples are like a series of frames that present imagery along with text and numbers in order to create a unified visual that is informative as well as being visually appealing. This graphic does a good job at accomplishing this because the background is solid and therefore, it is not distracting. This graphic is data bountiful because there is a clear hierarchy throughout the information that is being presented, which establishes change in data. One way that hierarchy is established is through typography. The year in which the television set was introduced is the most prominent of all of the information because it is the largest text and also because it is white and has the most contrast with the background of this infographic. The brand of the television is also included in smaller text and a darker color so this tells me that it is not as important to the evolution of the television, but is relevant because there are many different brands out there and also helps this visual become more informative. Another way that change of data is established is through spacing, which is a silent method of creating a division in information because there are no physical lines or frames separating one year from another. This is done successfully because there is an equal amount of space between every frame (to the left and right) of each set of information that is being presented. 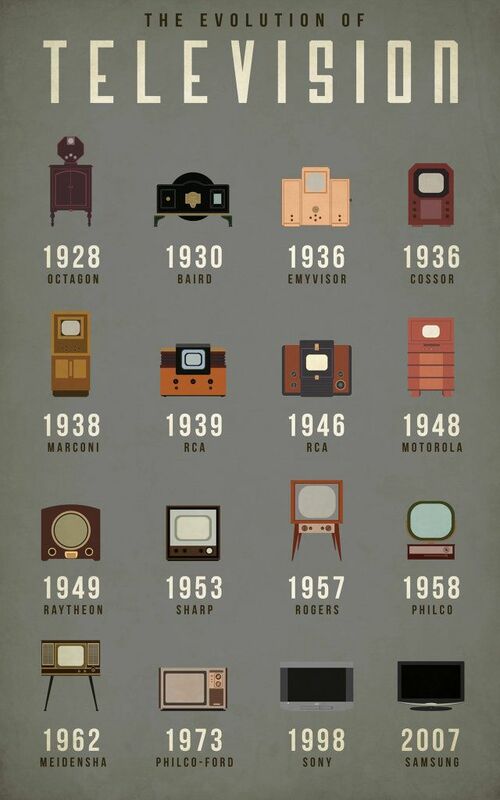 The designer of this also included illustrations of the television for every year so that the evolution of the physical characteristics of the television is apparent. There is a clear flow to the infographic and which makes it is easy to compare each television especially when they are next to each other, but also when they’re on different rows and columns from one another.